Ever watch Top Chef? This is All Stars season and Chef Antonia Lofaso is one of my favorites. I was so very excited when they announced she’d be on All Stars and to see that she’s done so well. I’ve recently started following her on Twitter and this is her latest twoted recipe (yes, twoted is past tense of tweet, as defined by Twitter creators). Season brisket generously with salt and pepper and sear in a deep pot until golden brown on all sides. Chop carrots, celery and onion. Add veg (mirepoix) to pot and continue to brown, add 1 TBS tomato paste, the thyme and bloom (cook for just a bit to open its flavor), cover with chicken base or water cover pot. Bake at 375 for about 3.5 hrs, strain and allow to rest. Rough cut and clean kale, chop 2 cloves garlic, in deep pot heat 1 tsp olive oil. Add kale and season with salt and pepper, sautee uncovered for 5 min, then cover and braise with garlic for 10 minutes, add bean and serve. I may just have to try this recipe today! 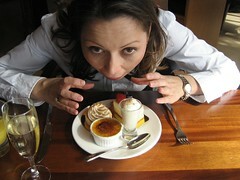 Posted on 20 March, 2011 20 March, 2011 Author BenfordCategories FOOD!! !